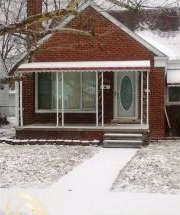 6776 Stahelin Ave. is a three bedroom, 1.5 bath brick bungalow in Detroit's Warrendale neighborhood that is available for an asking price of $75,000. This charming single family home, which was built in 1953, features a one car detached garage as well as a full basement. This property is represented by Darryl Sanders of Treasure Homes Realty in Southfield. More information about the 876 square foot, 1.5 story home is available here. 6776 Stahelin Ave. is your Featured Place to Live in the Warrendale neighborhood for this week.